Fenwick & West continues to keep me busy creating data graphics for a series of surveys they publish. 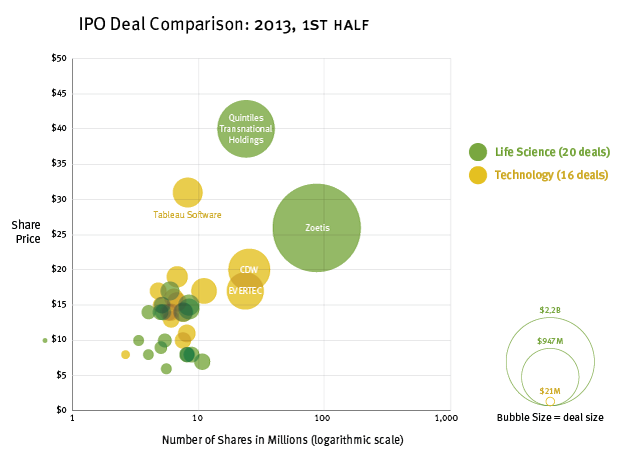 Here’s one from their Technology and Life Sciences IPO Survey, plotting each deal by number of shares (log scale) and share price at the time of the offering. The bubble size represents the overall deal size. The data visualization software company Tableau made the chart this time – looks like a pretty big deal. We’ll see if these bubbles burst. This entry was posted on Friday, October 4th, 2013 at 5:42 pm and is filed under Data Graphics, Graphs and Charts. You can follow any responses to this entry through the RSS 2.0 feed. Both comments and pings are currently closed. is it possible to narmalize these investment per field. like what is the size of tech market vs life-science…it might provide a better grasp of growth. just an idea. This graphic serves primarily to allow comparison of IPO deal size, and it gives you a quick sense of how the deals are priced. Are you saying you would be interested to see how these new deals fit into the existing markets? Could be interesting to chart the growth of the overall markets next to the IPO activity to see how they relate.